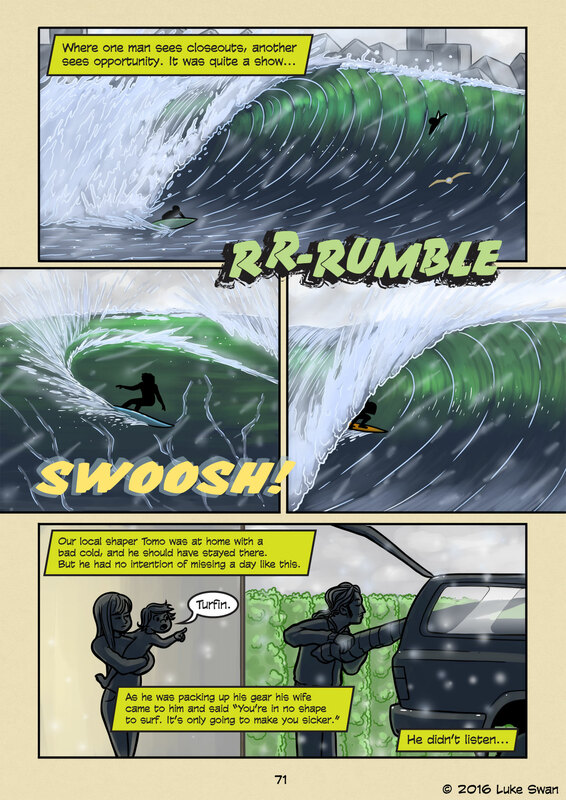 One man's closeout is another's treasure (#071) | Web comic "Surfer Joe"
Every wave ends in one of two ways. Either in a closeout, or it gets mushy and peters out. For those who don’t surf, a closeout is when the entire wave crashes in at once in fantastic finishing fashion. On days when the surf can be pretty nasty, there will be seemingly no time to ride the wave from takeoff to crushing end. Yet if you watch the best surfers out there somehow they seem to manage it fine. The faster a wave breaks the more it can seem like a closeout to some. As more experience is gained and fitness levels increase, the faster waves start to look more inviting. I find the speed of the wave actually has little to do with the swell size. For example, you can have huge, soft marshmallow waves. And you can have fast, hollow small waves. People put too much emphasis on size when it comes to rideability, but the trick is understanding the speed of the wave that you are used to. If you understand that then the range of the sizes you can surf is more variable. Of course, nothing is more punishing than big, fast, hollow waves that end in a gnarly closeout section. If you surf beach breaks then getting out can be really difficult and frightening. Some things to keep in mind the next time you paddle out.